My son had told us to look out for sign to an elephant seal colony “halfway up the PCH” which we duly did next morning as we set off north. Expecting the possibility of the odd glimpse of these huge creatures, we were staggered by pulling into a parking lot, walking twenty yards and seeing hundreds of elephant seals. Flopped on the sand in a sheltered bay you’d see a shower of sand fly up as one of them moved forward. Others just grunted and rolled over. Still more appeared to be in mortal combat – roaring and thumping each other in the throat. We learned form a helpful volunteer ranger that these were all males and the apparent fighting was toughening themselves so they’d be the prime selection for mating when the females returned from their present deep water sojourn. Apparently they have been known to kill whales so being aggressive seems to be in their nature. You’d never believe it from the first sighting of these recumbent bodies on the beach. 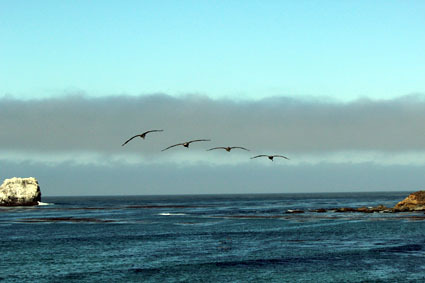 There was other wildlife around too – harbour seals out on the rocks, whales spouting further offshore and gangly pelicans which suddenly become elegant in flight. We eventually tore ourselves away from the delights of this encounter with nature and soon afterwards encountered another American natural phenomenon. We all know of stories of people touring American in campervans – they’ve been doing it since the days of the good old VW Camper. Now it seems there’s a huge rental market as we kept passing – in the opposite direction – and being held up by these behemoths rented from CruiseAmerica.com or El Monte RV. And that’s what they are called nowadays – recreational vehicles or RVs. 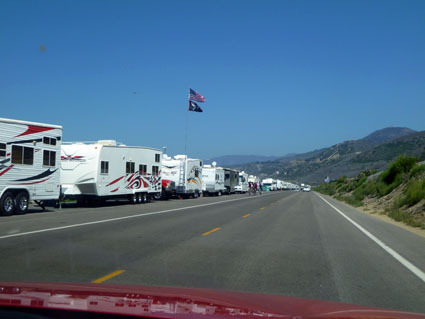 At one point on the PCH there must have been a convention – there were hundreds of them lining the road and the beach. I’ve been told I can be prone to exaggerate but not this time. There really were hundreds of them lining the road for at least a mile. We drove on up through Big Sur where sadly the PCH drifts inland somewhat so the more spectacular views in this area were hidden from us unless we wanted to park up and explore. 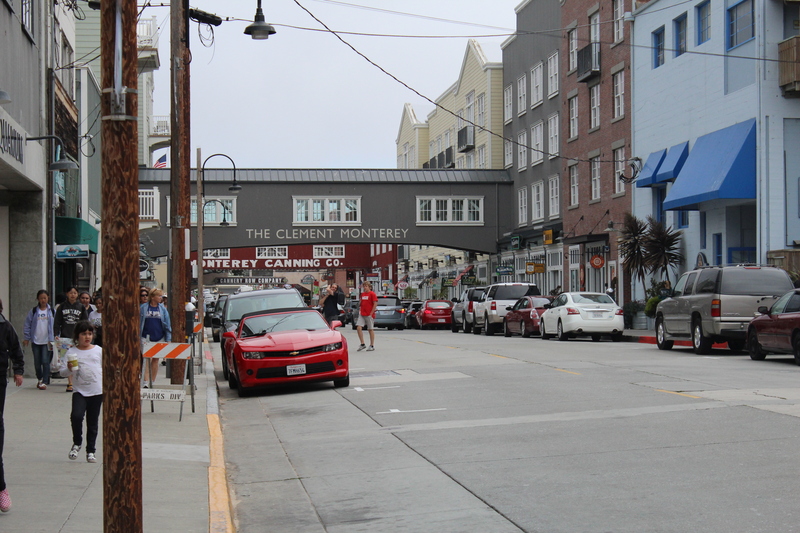 But with the delights of both Carmel and Monterey beckoning we decided to keep going. The highway is a wonderful drive but I’ve actually driven more scenic and dramatic routes along the fringes of the Mediterranean so we kept on going counting the huge numbers of Mustangs coming towards us and being passed by us. We had been told by everyone we had to rent a Mustang but failed to do so and had to make do with a Chevy Impala – well they run faster than mustangs anyway, don’t they. But there were loads of Mustangs in every hue driven by bright young couples, fifty-somethings and their offspring and a few loners perhaps out looking for their youth. Soon we hit Carmel which I was keen to visit because of its role in the great film Play Misty for Me, Clint Eastwood’s first as a director. He obviously loved the place because he became mayor a decade later and I remember it as the first of the new generation of actors taking up politics – Ronald Reagan of course got there first and got to the highest office. 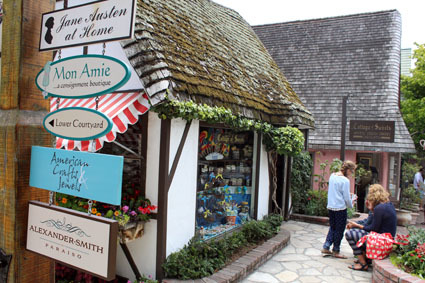 Carmel-by-the-Sea is very lovely, quaint clapboard houses, well-kept streets, flowers everywhere and not a McDonalds or any other chain store in sight. Apparently a bye-law requires women, well anybody I guess, to have a permit to wear high heels. We had a coffee, sauntered through its antique-shop-lined streets, bought some fudge and thought: “Need more time here”. This was to become a bit of a mantra for the whole visit. Perhaps doing America in three weeks was a little ambitious! 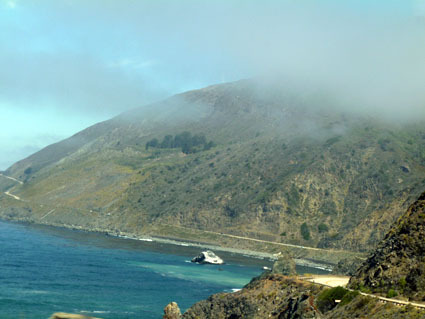 We headed off towards Monterey and declined the first road we saw which required a toll. It’s called the 17 mile drive and maybe we made a mistake in going on the highway as it appears to be lined with fabulous mansions and affords great coastal views. Next time we’ll pay the toll. 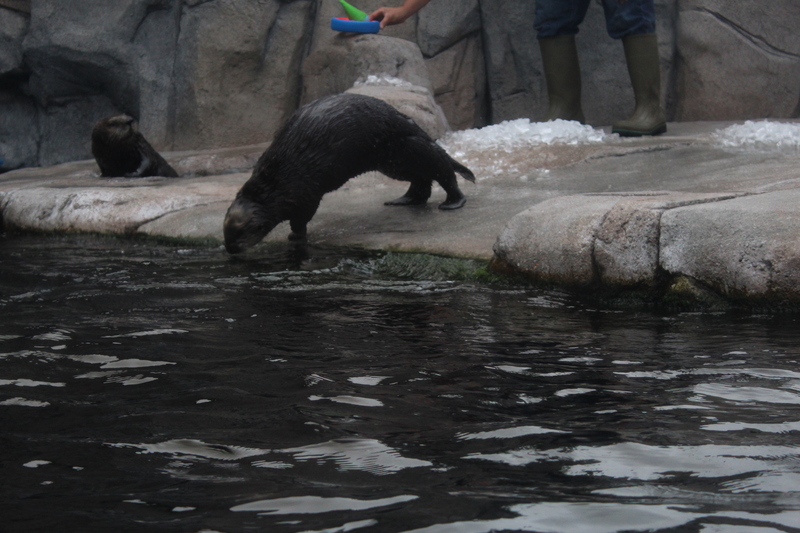 The main attractions for us in Monterey were the aquarium and seeing Cannery Row of John Steinbeck fame. As with most aspects of US tourism it’s been over-commercialised but we enjoyed the huge tanks with their great variety of marine life, watching sea otters at play and seeing puffins and penguins disporting themselves. Monterey looked as if it would repay a longer stay as well but we still had quite a way to go and had no idea how bad traffic entering San Francisco on a Sunday evening would be. It wasn’t too bad and the faithful Dolores navigated us directly to the Tomo Hotel in Japan Town. It’s a funky, anime-themed hotel right across from the peace pagoda. Spacious rooms were complemented by a shabu-shabu restaurant in house which saved us the hassle of looking elsewhere. You dip vegetables, noodles and thin strips of beef into a cauldron of water boiling on your table. It’s one of the few kinds of Japanese cuisine we didn’t try last year so could tick that box and while interesting and tasty it’s a lot of faff and won’t become a long term favourite. But we did go to sleep in a room with some excellent manga art on the wall.